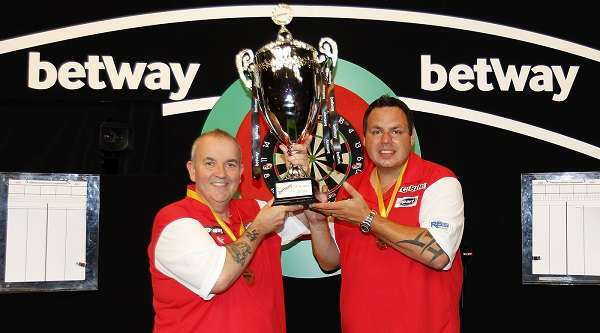 As our darts betting tips lodach recommended last week, England pair Phil Taylor and Adrian Lewis retained the World Cup of Darts, beating the Netherlands’ Michael van Gerwen and Raymond van Barneveld in Sunday’s final in Frankfurt. In what was a repeat of the 2014 final, Taylor and Lewis, two of the game’s greats who have amassed 18 world titles between them, claimed victory in the £250,000, 32-nation tournament. After the win, tempers flared between winners England and tipped finalists The Netherlands, as Adrian Lewis and Michael van Gerwen shared a heated exchange following Lewis’ celebrations cheap NFL jerseys after sealing a dramatic win for England. Tensions initially began to rise after Lewis hit 180 and celebrated boisterously in front of his Dutch counterpart but things soon reached boiling point when the Englishman, requiring 16 to take the championship, missed the double eight and consequently offered MVG a chance to get back into the match. It was chance missed by the narrowest of margins as Van Gerwen’s dart fell just wide of the D18 stroking the outside of the wire. Up stepped Adrian Lewis who with his next dart, landed it sweetly into the D8 to give England their second consecutive, and fourth in all, World Cup win. In truth, it was an exciting finale to a great tournament that was always likely to boil over given the see-saw nature of the match which looked at one point to be heading in favour of The Netherlands. The opening contest, a singles tie between Taylor and Van Gerwen, provided a victory for Taylor who had a 103 average and closed with a 149 checkout, giving England the advantage by 4 sets to 1, before things swung back in Dutch favour as Lewis lost 4-3 to Van Barneveld in an 11-darter. From there, the Dutch won the pairs even after Taylor’s 103 finish had England looking good before Van Barneveld responded with a 104 finish securing the doubles round for The Netherlands, to put them ahead 2-1. England didn’t take things lying down and made things level again soon after when Taylor saw off the challenge from Van Barneveld by 4 sets to 1, which bought about the decider, where Lewis beat Van Gerwen, again 4-1, before the goading the Dutchman into the dramatic finish. Earlier in the day, Taylor and Lewis, had seen off Northern Ireland’s semi-finals challenge, led by duo Brendan Dolan and Daryl Gurney. Surprisingly, England’s hardest game had come in Thursday’s first round match against Spain who took “The Power” and “Jackpot” to a cheap jerseys tense finish. From there, the English pair gained momentum and steamrolled China and Austria before reaching Sunday’s ties with Northern Ireland in the semis and The Netherlands later on at the event’s climax. For The Netherlands, they didn’t really hit a bump on their way to Sunday’s showdown either, as they cruised past Russia, the Philippines, Australia and Belgium, who had themselves beaten Scotland, represented by world champion Gary Anderson and Robert Thornton, in the quarter-finals. As for the other home nations, Northern Ireland defeated Japan, neighbours the Republic of Ireland and Canada on the way to meet England. Wales, on the other hand, bust out in round two at the hands of the Canada, having sailed past Finland 5-1 in the opening round. While European eyes are currently fixed on the European Football Championships, it’s worth remembering that the small matter of the Austrian leg of the European tour darts begins on June 10. Featuring the usual roll-call of big hitters, 48 players will compete in the PDC Austrian Open which runs for two days until June 12 at the Multiversum Schwechat in Vienna, with a £115,000 prize fund and is the fifth leg from the ten European events on the Architektur PDC de Pro Tour. For those that don’t know, the tournament is structured as a straight forward knockout and progress format. Darts tips wise, once more Michael van Gerwen leads the betting and is evens at both Bet365 and Betway but the two are split on Phil “The Power” Taylor’s Of chances with the latter offering a half point higher at 9/2 on the Stoke born player getting the better of the Dutchman for the second time in a week. The smart money might well be on Dave Chisnall who lost in the final of the Hamburg leg in May and is available at around 16/1, while Scotland’s Peter Wright can be backed at 10/1 and is more than capable of squeezing his way to victory. Elsewhere the prices do start to drift along with the likelihood of a victory for the outsiders with perhaps Michael Smith being the highest placed among the also rans. If you are looking for a distance bet or even a good value each way wager, then popular local thrower Mensur Suljovic is a best price 40/1 and, despite being in his forties, is Way currently in the process of proving that he deserves a place at the oche at the world’s top darting events. The 44 year old Bosnian born world number 19 has enjoyed wholesale jerseys upsetting the big guns while representing his adopted Austria. Last year he scalped both James Wade and Simon Whitlock, and is disproving the theory that Darts is young man’s game as, including his results in 2015, he is currently enjoying his best career form and is at last looking like a world-class professional darts player.